Everyone with even the slightest hint of a green thumb and love of nature will love what Urban Jungle style has to offer. Big green plants, natural colors, and animal decor will wake up an urban explorer in all of us. 2017 is all about getting back to our roots while still living the modern lifestyle. In this time of digitalization, sleek surfaces and the general feeling of artificiality, more and more people desire to turn their homes into a warm oasis that will recharge and refocus our minds. This return to innocence will find its materialization in the interior design style that was named the Urban Jungle. This style, however, will not be reserved for homes only, but also find its way into cafés, hotels, and workspaces of today. The feeling of warmth and lightness it provides will mentally take us to a place where we feel like ourselves the most: back to nature. Urban Jungle places great emphasis on plants. Find a sunny spot that can be viewed from your most used area of your home to maximize the effect. 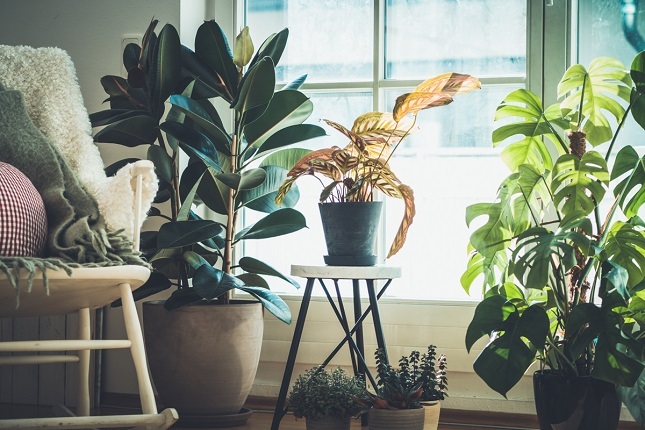 Designers usually opt for tall indoor plants such as a fiddle leaf fig tree, but in reality, anything tall and green will do. Go with a huge Monstera Deliciosa, some Scheffleras, Philodendrons, a Ficus or two or one of many types of Fern. Combine them with modern planters for a true Urban Jungle look. Wicker creates a pleasant feel in any modern space and can soften any design, so it's not a surprise that many designers choose to incorporate wicker into many urban spaces. They invoke the feeling of warmth and sun, bring coziness, and create a stress-free natural atmosphere. Its recognizable texture, natural color, and simple traditional design can really add a little something-something to your Urban Jungle design. Another great thing about wicker is that it can be used successfully both inside for living rooms and outside for outdoor rooms, patios and porches. Wood has been of the most popular interior design materials for ages because its natural color, textures, and patterns can emphasize any interior design style. So, any natural style such as Urban Jungle would be incomplete without some warm wood. In 2017 and beyond you can expect to see a lot of wood with a smoother finish to go hand in hand with contemporary philosophy. Wood combined with white and metallic details will perfectly fit into every Urban Jungle. Urban Jungle is not all about green and earthy tones, but it’s actually pretty diverse. Although white walls, wood tones, and green plants dominate the space, accents in the form of black, yellow, pink and metallic are those that bring the whole look together. Even though this design has plenty of textures and colors, it still tends to be simple. The plants, decor, and accessories, cannot just be thrown into the room to call it the Urban Jungle. Everything has to have its order and place, and above all, these designs seek functionality. Each room has to be somewhat perfect. Nothing should be broken or disfunctional in order for this green design to work miracles at your home. Your bathrooms and kitchen should have no leaks or plumbing issues. If you notice anything out of order, the best solution is finding a good plumber to help you bring your Urban Jungle to perfection. Also, there should be no clutter. Make sure you clean frequently and invest in good storage so everything has its place. The cleaner and more functional your home are, the more perfect it will get and help you embrace the greenest interior design so far - Urban Jungle one. Jungle prints can be incorporated in the form of wallpapers and fabrics, in small details and big elements alike. But, you don’t have to get floral or animal print furniture to pull Urban Jungle off. It works even better if you decorate your plain sofa with some jungle-style pillows or some faux zebra throws. Round up the look with some animal figurines or statues that will further emphasize the look. Don’t fill up space with these though, but get one and make it a focal piece of the room. So, if you’re looking to get away from sterile spaces and turn your home into a tranquil sanctuary, make sure to give Urban Jungle a try.